Just in time for Halloween, I would like to introduce you to Harlequin. She is an African penguin with a purple bracelet on her right wing. 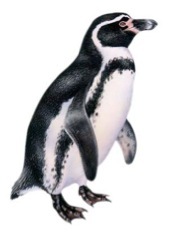 She was born here at the Aquarium on November 8, 1992. 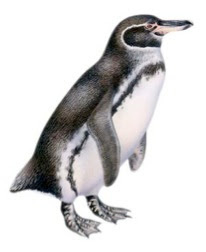 The four species of penguins in the Spheniscus genus are also referred to as the banded or Harlequin penguins. 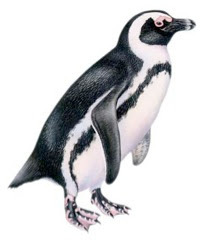 They include the African penguin, Galapagos penguin, Humboldt penguin and the Magellanic penguin. These four species all have similar coloration, with a black stripe across their chest and a white stripe around their eyes. The varied pattern of these stripes is how you can physically distinguish one species from another. 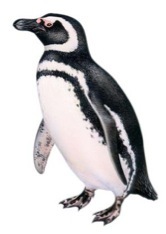 Come on down to see the penguins this weekend in your Halloween finest! Be sure to look for Harlequin, she'll be the one in the penguin "costume".